Its database provides first-of-its-kind visibility into the country’s innovation economy with an excess of 12,000 entities already in the system, including companies and early-stage funders: angel groups, accelerators, government programs, venture capital firms and private equity funds. Hockeystick came to us with an ambitious idea. They wanted to create an accessible and innovative global database of private market data for startups and investors. The goal was to reduce the inefficiencies of how data is currently collected and consumed in private markets. Hockeystick already had an established product with a number of reporting and data analysis tools. The challenge was to create an elegant design that integrated the new open database features with the current application while improving the overall user experience. We also needed to accommodate a number of different data sets to support Hockeystick’s partnerships with other organizations like the CVCA. Hockeystick was also seeking a design aesthetic that communicated the look and feel of a premium financial services product. Without an internal design team, Hockeystick partnered with DesignedUX to bring the idea to reality. We worked with the Hockeystick team to define the concept and iterate on possible solutions. We mapped out the user journeys for free and premium customers. With a common vision for the product established we designed wireframes and high fidelity mockups to pass along to the Hockeystick development team for implementation. The next phase of the project was to design the new marketing website. 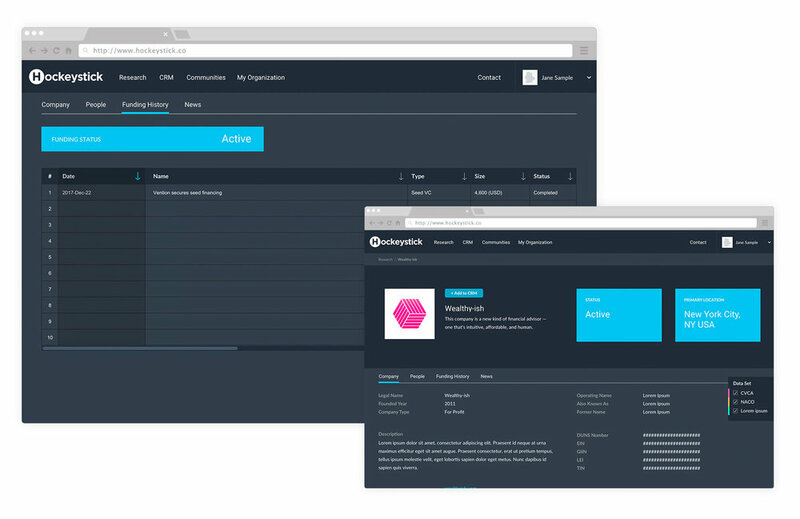 Hockeystick was looking for a fresh, clean and sophisticated design to communicate the benefits of the new open database project and value proposition of the newly integrated platform. Hockeystick’s customers include accelerators, angel groups, government, private debt, venture capital and companies. An extensive amount of primary and secondary sources are accessible on the internet and other domains when conducting research on public organizations and markets. However, when it comes to researching the information on private markets, information is generally inaccessible and requires significant effort to identify, curate, and verify information. Most venture capitalists and prospective investors do not have the time or technical resources available to go through this process for a single or multiple companies. Hockeystick is making this research more transparent and accessible by verifying market data and housing it in their online database. Making data meaningful to drive people first innovation through an open community and secure digital platform.